OnePlus One, the first phone released by OnePlus almost two years back as a flagship killer is getting more interesting. Yes, the device will be joining the Ubuntu family. As of now OnePlus One got a Ubuntu Touch which is not a daily driver as of now. (This is under development now). The staff member post on the OnePlus forum says that it also will be available for the OnePlus X soon. It is interesting to see that OnePlus is supporting a non Android operating system on their Android Phones. Ubuntu offers quick access to all of your content and the full command line interface. The tailor-made smartphone version of Ubuntu was meticulously designed to revolve around your life. Ubuntu’s scopes bring everything you need together on one screen, so your favorite services and content are always within reach. The release of Ubuntu on the OnePlus One underlines this commitment, while development on a OnePlus X release is well underway. Developers, fans and tech enthusiasts have all been clamoring for a full Ubuntu release on a phone. We’re excited that our devices are some of the first to receive an Ubuntu release. Be aware, the Ubuntu release that is currently available for the OnePlus One remains a work in progress and more features are expected to be added to the build in the future. 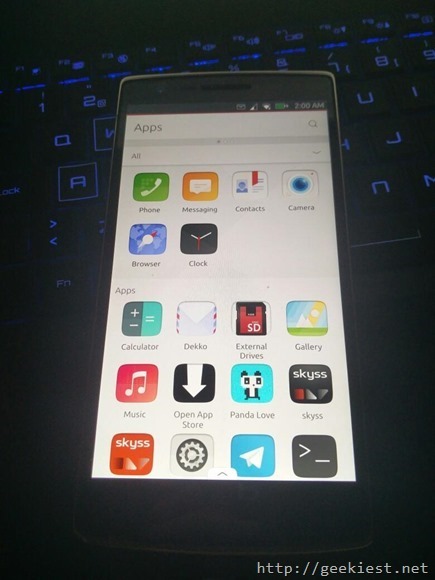 OnePlus One gets Ubuntu Touch a non Android operating system.